The different types of cloud computing solutions offer the e-commerce industry better options. It is far better than traditional computing solutions. Computing solutions often provide too limited features or too expensive packages. This does not help starting businesses with a limited budget. 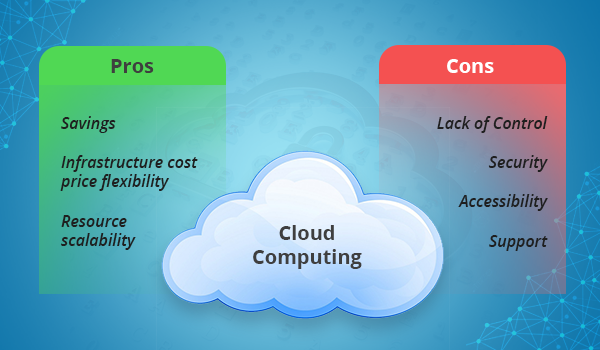 So, understanding cloud computing pros and cons can help businesses choose. Savings top the cloud computing pros and cons list. This goes to all businesses. Businesses will always go for the value of their money. So, take note of the several ways cloud computing can save up for your business. You can cross out the infrastructure cost right away. Cloud computing provides the infrastructure that you need in traditional computing. This requires physical setup of hardware and software. They need maintenance and constant upgrades. You can let go of this huge expense because cloud computing provides the infrastructure through cloud. The provider takes care of updates that the cloud needs. You should not miss infrastructure in the cloud computing pros and cons list. Cloud computing offers price flexibility Provide that other network management can’t easily provide. Shared environment makes this possible for cloud computing. The numerous servers that provide accessibility to clients made the pay-per-use policy possible. The resources you won’t use will be used by others. Yet, there won’t be shortage of resources because remote servers are all over the globe. This gave price flexibility a spot in the cloud computing pros and cons list. Resource scalability is a game changer in computing. This breaks the tradition of fixed packages that could limit or waste your resources. The need for computing resources is not a fixed demand. There could be a sudden spike in traffic or an unexpected dull week. Cloud computing provides what your site needs. If it is not needed, you don’t need to pay for it. You can always upgrade your service when your growing business needs expansion. This made resource scalability part of the cloud computing pros and cons list. Cloud computing has managed services that takes care of everything. This will sound good if you don’t know anything about IT management. But this is worse for businesses since you can’t develop your own brand and match your business platform to it. There is less opportunity for customization. The issue of lack of control in cloud computing resulted to more issues. Until now, these issues are the same concerns of people considering cloud computing. You better find the best solution to the disadvantages in the cloud computing pros and cons list. Since there is lack of control, security is highly reliable to what cloud computing provides. They provide the standard security, but all your data are uploaded online where cybercriminals lurk. Maintenance and updates of software are dependent on cloud computing, so you don’t get to enhance your data security. This made security part of the cloud computing pros and cons list. Yes, all your data are accessible through the cloud anytime, anywhere. The question is, is it still accessible without the Internet? Since the Internet establishes the cloud network, it is impossible to access data without the Internet. Some people also use programs that are not compatible in the cloud. Thus, accessibility Provide is conditional: It is accessible only when there is Internet and only when your data can be accommodated by the cloud. This brought accessibility to the cloud computing pros and cons list. With all the managed services cloud computing provides, ironically, it does not provide great support. Since, there is less opportunity to customize, there would be less questions. Unfortunately, clients rely heavily on FAQs on websites for guidance. Cloud computing is not the on-call experts that any business deserves to have. When you need their help for unavoidable technical issues, assistance will come, but not as efficient as in other managed services. This brought client support as part of the cloud computing pros and cons list.